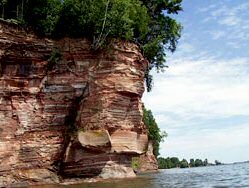 The Keweenaw Water Trail, which circles the Keweenaw Peninsula, is located along Michigan's northernmost shoreline and gives the paddler the opportunity to experience the many moods of the big lake along very different shorelines. The entire trail is accessible by any small water craft (including kayaks and canoes) and can be covered by the average paddler in 6 to 8 days, but extra time should be allowed for weather delays. The trail includes rugged shoreline, small towns and opportunities to observe unique wildlife. A Water trail map is available from the Keweenaw Convention & Visitors Bureau at: (800) 338-7982.